We all like to keep the house nice and tidy, so what better way than to buy someone this lovely set of coasters as a gift! They are sure to fit in with any surrounding decor. The text 'MR And MRS' is fixed. You can then personalise this coaster holder with a surname up to 15 characters in length. All personalisation is case sensitive and will appear as entered. The material of this item is wooden and has an inner cork centre. This set contains 6 coasters. Ideal for Newly-weds, Weddings, Christmas, Birthdays. 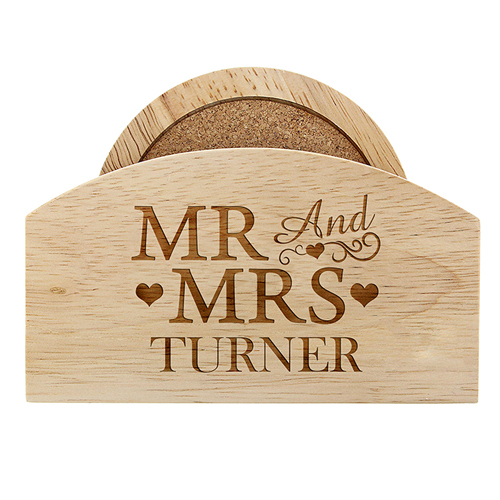 Personalise this coaster holder with a surname up to 15 characters in length.